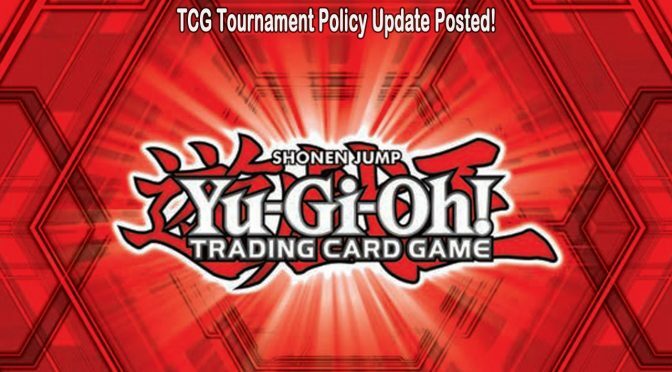 Konami has just released some updated policy changes and additions to its TCG tournament policy and rules of note is a new section added to address hygiene issues. Not everyone realizes that Tournament Policy is just as important – just as Problem Solving Card Text provides instructions on how a card works, tournament policy provides instructions on how a tournament works. You need to understand policy in order to make the most of your tournament experience. Version 2 of the KDE-US Yu-Gi-Oh! TRADING CARD GAME Tournament Policy has undergone a number of changes, designed to make the document easier to use. (You may notice there’s a KDE-US version of the document, and a KDE-E version of the document. The policy is essentially the same, but the contact information, etc. will vary according to region. Please be certain you are looking at the document for your region). First, we have combined two previous documents (KDE Official Yu-Gi-Oh! TRADING CARD GAME Tournament Policy and KDE Official TRADING CARD GAME Tournament Policy) into one single document. This makes us less likely to repeat ourselves, and makes you less likely to overlook important information. You won’t miss anything, because now it’s all in one document. This section discusses the roles of various attendees at an event, including what is required and/or expected of them. This section covers expectations and requirements for Duelists attending an event. We have added some new information to this section, as well as clarifying previous policy. This section clarifies some previous policy, and some new information has been added. Prescription medication may only be brought to an event or used by a person for whom it has been prescribed. Electronic devices other than a calculator may not be used during a Match. Any device such as a smartwatch, etc. that can send or receive messages must have messaging functions disabled during a Match. Duelists may not wear headphones during a Match. Duelists may not eat or drink at tournament tables, including between rounds. Duelists may not wear masks, costumes, or face paints which cover their face during the registration process or during a Match. All persons attending the tournament are responsible to abide by the above restrictions. This is a new section, requiring all persons attending a tournament to be clean and wear clean clothing. If you or your clothing is excessively dirty or bad-smelling, you can be penalized. Continuing on with changes is Section III. Tournament Information, including tiers and formats updates. Special Formats has been added to the list of available formats. Tournaments such as Tag Duels, 3 vs. 3, etc. are now included as part of official Tournament Policy. This is a new section explaining the concept of the Game State. It will help make other sections of the tournament policy easier to understand. and, Subsection M. Private Knowledge, Subsection N. Card/Hand/Deck Verification. This section covers information about the different kinds of infractions that can occur at a tournament. It gives a brief explanation of each type of infraction, and the penalties associated with these infractions. You should also read the Official KDE-US Tournament Penalty Guidelines to learn more about Tournament Infractions, as knowing what you can and can’t do at a tournament will help keep you out of trouble. This is an entirely new section. Please read it all the way through! Policy on infractions and penalties hasn’t changed, but it was previously found only in the separate policy document, Official KDE-US Tournament Penalty Guidelines; and a lot of people weren’t aware of it. We decided to add an abbreviated version to this document, so you will be better prepared. Finally Section IX. Card Legality saw a few updates made. They include: Subsection D. SHONEN JUMP and Yu-Gi-Oh! Graphic Novel Promotional Cards, Subsection H. Cards with Updated Text or Errata, Subsection K. Altered Cards, and Subsection L. Marked Cards. Konami is quite excited about this update to the document, and hopes it makes Tournament Policy easier to navigate and understand. Please be certain to read through the document carefully, prior to attending an event! Knowing this information will help ensure you are prepared, and allow you to make the most of your tournament experience.